The days are shorter, the temperature is lower, and it is almost winter break; which means time for some family fun! The beginning of December starts the chilly part of the holiday season. As your family breaks out the decorations, sings to cheerful music, and snuggles by the fireplace, don’t forget to enjoy some family fun activities. Kimatni D. Rawlins is a former running back for Georgia Institute of Technology. He is now the founder of the health, fitness and wellness website Fit Fathers. US News published his article called, “7 Family Fitness Ideas for Winter.” Rawlins said, “Burning calories during a fun activity is the easiest way to melt fat.” He describes activities as simple as going outside and playing in the snow to visiting an indoor trampoline park. 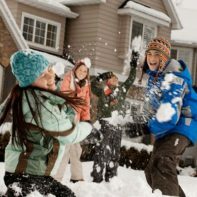 Having a mixture of indoor and outdoor winter activities will keep you from hibernating all winter and missing the opportunity to create priceless memories with your family. Take the stairs whenever possible instead of an elevator or escalator. Walk around your building’s hallways during your lunch or coffee break. Don’t wait for spring for a thorough house cleaning. Wash the inside of your windows, vacuum or shampoo the carpet, or clean out your closets. Watch and follow an exercise video or DVD rather than a movie. Trying these winter break family friendly activities does not mean you shouldn’t take time to relax and binge watch some of your favorite Hallmark or Netflix holiday specials. There should be a healthy balance to keep your family active through the holidays. Winter break will go by in a blink of an eye. Some of your favorite memories might be the cold ones you create right outside your door! We hope you and your family have a joyful holiday season!